What determines the size and form of redistributive programs, the extent and type of public goods provision, the burden of taxation across alternative tax bases, the size of government deficits, and the stance of monetary policy during the course of business and electoral cycles? A large and rapidly growing literature in political economics attempts to answer these questions. But so far there is little consensus on the answers and disagreement on the appropriate mode of analysis. 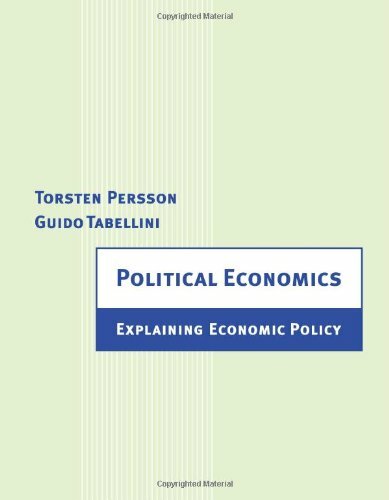 Combining the best of three separate traditions -- the theory of macroeconomic policy, public choice, and rational choice in political science -- Torsten Persson and Guido Tabellini suggest a unified approach to the field. As in modern macroeconomics, individual citizens behave rationally, their preferences over economic outcomes inducing preferences over policy. As in public choice, the delegation of policy decisions to elected representatives may give rise to agency problems between voters and politicians. And, as in rational choice, political institutions shape the procedures for setting policy and electing politicians. The authors outline a common method of analysis, establish several new results, and identify the main outstanding problems. Torsten Persson is Director of the Institute for International Economic Studies at Stockholm University and Centennial Professor at the London School of Economics. Guido Tabellini is Professor of Economics at Bocconi University in Milan and President of the Innocenzo Gasparini Institute of Economic Research, also at Bocconi University.